My word! But I could barely listen to Eric Quizon describing how his father flitted between consciousness and unconsciousness during a press conference called to give an update on Dolphy’s condition last night. It felt as though somebody took hold of a piece of my heart with a thumb and a pointer finger and then twisted in a wicked pinch. What Quizon was describing, I know all about. That was how things were with my Mom on the days immediately before she passed on. But, of course, in contrast we had all let go – in our hearts, in our minds and in our souls. People on the brink, they won’t go if you hold on, you know! But seeing as we all did how Mom was in so much pain, none of us could possibly want to hold it against her if she wanted to finally rest. In Dolphy’s case, I will not be surprised at all if he makes a full recovery, especially as an entire nation is willing him to stay. All the media coverage that is being devoted to Dolphy's state of health of late, it has all been so surreal. The usual ills of society as well as affairs of state have all been relegated to the latter part of primetime news shows. 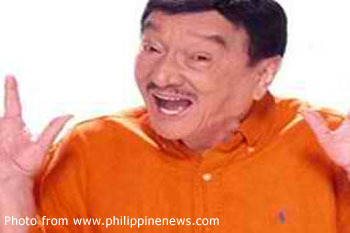 In fact, TV Patrol one evening devoted a third of its entire show to Dolphy alone. On the other hand, while Dolphy’s state of health is not at all an affair of state, it is nonetheless understandable if it is considered a matter of national concern. Simply stated, you cannot call yourself Pinoy if your life has not been touched by Dolphy one way or the other. Thus, all the attention that is currently being devoted to him is but appropriate. Typically, there are calls for Dolphy to be declared a National Artist. What is typical is that he had to get to the brink before anyone seriously thought about it. If at all, there will always be the stench of ‘before-it’s-too-late’ attached to the title if it is bestowed upon him. Would be nice for him to get it, of course; but it would be no more than the coup de grace to a long and distinguished career. If you care to, check his profile at the IMDB web site. He makes even the most famous Hollywood legends look lazy in comparison. Much more than any title, therefore, Dolphy has already achieved that which many National Artists can only dream of: his very name is etched in the psyche of an entire nation. There are National Artists that I neither know an awful lot about nor care to know more of. What’s more, the name Dolphy is associated with laughter and happiness, emotions that all of us who live in this country are always in dire need of; if just to allow us to get by with the daily grind of living. For those of the older generations, in particular, while we are all painfully aware that time takes no prisoners, it is nevertheless difficult to imagine or accept a world without Dolphy. Among my earliest memories, for instance, are of being cooped inside the house on hot summer days with my siblings and the household help enjoying those black and white Dolphy movies being aired on afternoon television. This was in the sixties, an era when comedy was comedy; and practitioners did not have to stoop down to using sexual innuendoes just to make people laugh. 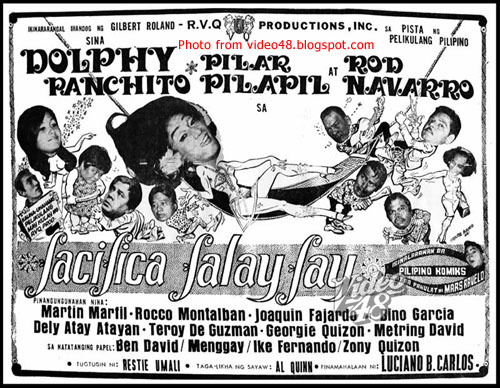 Comedy was just clean fun; and there was a glut of talented choices: Pugo and Tugo, Chichay, Babalu, Matimtiman Cruz, Metring David, Elizabeth Ramsey and the Reycards, to name a few. As it always was through the years, the Dolphy movies were the ones that brought the most laughter. How ridiculous was it for him – skinny that he was back then – to be going around the jungle in loincloth spoofing the famous Edgar Rice Burroughs character Tarzan? 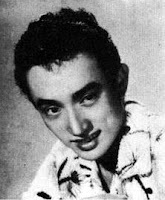 Dolphy’s character, by the way, was Tanzan. Who can also forget Dolphy’s transvestite characters? For somebody who sired eighteen children, there is a bit of irony in that among Dolphy’s funniest movies were those when he played transvestite roles. 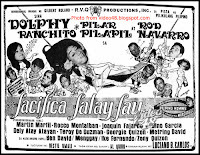 Both Facifica Falayfay (y Fafalafalakfak) and Fefita Fofonggay (Viuda de Falayfay) were riotous comedies that had everyone holding onto their sides. There were countless others, as one would surmise; but one I remember with special fondness because it was among the first movies that I was given permission to watch at the rickety and bedbug-infested movie house inside the Base. The film was called ‘El Pinoy Matador’ and was shot in Spain. The fact that it was in colour also made watching the movie quite the occasion for me. Of course, subsequent generations would become acquainted with Dolphy through the burgeoning and eventually ubiquitous medium that is television. His weekly sitcom ‘John en Marsha’ would become as much a part of Pinoy households as rice and adobo. Dolphy’s character John Puruntong even lent its name to a style of short pants. And how many times did we hear Dely Atay-atayan’s lines “magsumikap ka” and “mabuti hindî nagmana sa ama etc., etc., etc.” mimicked inside our very own households? There are people like me to whom it seems that Dolphy has been around like forever. Yet that does not mean that one ever gets tired of the comedian. On the contrary, Dolphy’s face is the sort that for some reason has the ability to make people laugh just by looking at it. I do not mean this disrespectfully. On the contrary, I think that God gave him the perfect face for what would eventually be his chosen career for an entire lifetime. It’s the same for the British actor Rowan Atkinson. The face is made for comedy, period. Of course, when Dolphy does deliver his lines, he always does so with the timing that is simply the mark of a genius. Ask any comedian. It is always in the timing; and Dolphy’s has always been spot on.